The Wymeswold footballer who was racially abused during a cup final this week, prompting his entire team to walk off the pitch in protest, has thanked people who have sent him messages of support from all over the world but says he will never play another match. Linford Harris told the Melton Times today (Friday) that he hopes the incident will serve as a wake-up call to the game’s ruling body in this country that racism is an issue at the grassroots of the game as well as professional football. He praised the way Manchester City striker Raheem Sterling dealt with the abuse he received during an England international in Montenegro last week and said black footballers must highlight it whenever it happens instead of staying quiet. Speaking shortly after Leicestershire Police confirmed it has launched an investigation into the incident, which happened during the Saturday Vase final against Cosby United, Linford (24) said: “I’ve been doing a lot of interviews in the media since it happened and I’m really glad this whole thing is getting out there. “I’ve had messages of support from people from all over the world but I’m finished with football, I won’t be playing again. “I saw what happened with Sterling and he did the right thing to highlight it and Romelu Lukaku has also said players should walk off if they are racially abused and I totally agree. “I didn’t know what to do when it happened to me. “The FA didn’t give me any help at all and I didn’t know who to talk to about it. Linford said he had been racially abused when he prepared to take a penalty for Wymeswold Reserves FC during Wednesday night’s match. He was sent off later in the game and heard further abuse when he returned to the sidelines as the game continued. The team then took the decision to leave the field in protest with 12 minutes remaining of the final. Linford added: “The abuse was disgusting and people there shouldn’t have had to hear it, as well as me. “I had family members in the crowd and there were children there too. Leicestershire Police said: “We have received a report of an alleged racist incident at a football match at Whetstone on Wednesday. “Enquiries are ongoing into the incident and anyone with any information about it is asked to call us on 101, quoting crime number 19000171956. 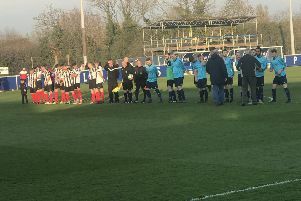 The County FA, who hosted the match at their Holmes Park headquarters, in Whetstone, Leicester, is asking for eyewitnesses of the incident to come forward. They also want statements from stewards and match officials before ruling on the outcome of the match. A spokesman said: “We ask that anyone who was present at the match to provide their observations by email to info@leicestershirefa.com. “Leicestershire and Rutland County FA will investigate all allegations related to this game and take the necessary discipline action. “As this is now an ongoing investigation we will not be able to comment any further. Wymeswold FC released a short statement saying they be assisting the county FA in their investigation and they ‘wish to go on record to thank everyone in the football family for the support shown’.